A new training video for how to boxtrap dogs is now available!!! – visit our website at GWR Products. Now it’s time to bait the trap. Baiting the trap is a strategy like playing a chess game. You are not just placing something stinky in the trap so they walk in! You want to use bait to guide them right down to how they trigger the trap. Checkmate! 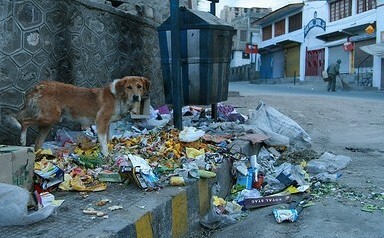 Be sure the environment is set up so the dogs are hungry (How much garbage and food is around and where is it? ), create ways to bring them to the trap and then into the trap, and then guide them to place their foot where it triggers the trap the best. Be sure your surrounding environment is not competing with your baits. When we were trapping dogs in the Caribbean, it was hard working around the resorts because of so much garbage and food scraps laying around. Fortunately we often worked with resort managers who locked up the garbage and who told their staff to clean the grounds. When working with island governments we had to ask them to improve their scheduled dumpster pick-ups. For a detailed training video on on how to box trap dogs – visit our GWR Products page. Sometimes the most efficient way to capture dogs is with a box trap. In disaster response, the first dogs are caught by hand, but there gets a point when the fearful dogs cannot be approached. Then box traps will bring the dogs out of the rubble. In animal control or dog rescue, people may need to capture specific dogs. Box traps can be placed along their travel route or favorite spots. And in trap/neuter/release programs such as the work I did in India and Caribbean, box traps are an efficient way to gather many dogs. But few people know how to successfully use box trap. Attend to the details…..and here is one way to do it. You can download a free handout on box trapping from Global Wildlife Resources by visiting our free Training Library. Without any doubt, my favorite trap is the Tru Catch 48F Folding Dog trap. I have used them in Montana, New Orleans, the Caribbean and have even taken them to India (with great difficulty). I like the Tru Catch 48F Folding Dog trap because it is very rugged, strong and lasts for years even with ocean salt.. It is compact so many traps can me moved together. It is very versatile to use in many ways because both ends open so dogs can be shifted to a varikennel or to another trap. The best source for purchasing the Tru Catch trap is to contact Wanda or her family at Heart of the Earth Animal Equipment. In this blog I have spent quite a bit of time talking about attitudes, behavior, and things like dominance and the energy of conflict. I am really enjoying your comments about his – Thank You! Please send more! I will continue to write about these topics, especially when there are comments generating discussion, but it is time to also give you some “meat and potatoes” stuff like more techniques and equipment. Keep watching for a NEW VIDEO on Using a Y pole to capture a Mexican Wolf. I am currently working on the technology to show this on my blog and website.